Wolfgang Schauble also flagged up that Greece has not yet implemented its new privatisation fund. This was a key part of July’s bailout deal, under which €50bn of Greek assets will be sold off to cover the cost of recapitalising its banking sector. 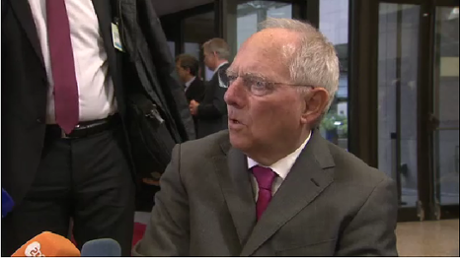 Germany’s Wolfgang Schäuble has arrived at the meeting. He sounds fairly relaxed as he speaks to reporters. Schäuble says that Greece has not yet taken all the required steps to qualify for its next aid tranche (according to his knowledge anyway). Laconic Schäuble over #Greece: “I don’t think we can have an agreement today but we’ll hear what the Institutions have to say”. Dijsselbloem used the word ‘optimistic’!! An official limo has just deposited Eurogroup president Jeroen Dijsselbloem at today’s meeting. He gave a brief ‘doorstep’ to reporters — it sounds like he’s not expecting to sign off Greece’s next aid tranche today. Dijsselbloem says progress has been made in recent weeks regarding Greece’s banks and reform programmes. But there are still open issues, and a lot more work needs to be done in the next two weeks. The first set of milestones must be completed soon, he adds (which would pave the way to disbursing that €2bn in new loans). And Dijsselbloem says he can’t speculate about the political crisis in Portugal where left-wing parties could soon win power. 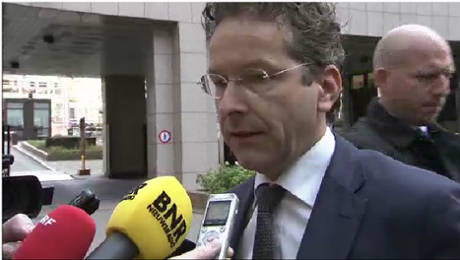 My understanding is there will be debate today and tomorrow, says Dijsselbloem. There is always a legitimate government in each country, and that’s the government we work with…. Ministers are starting to arrive at today’s Eurogroup meeting in Brussels. Commissioner Pierre Moscovici has told reporters gathered outside that he hopes Greece will receive its €2bn aid tranche this week, if not today. 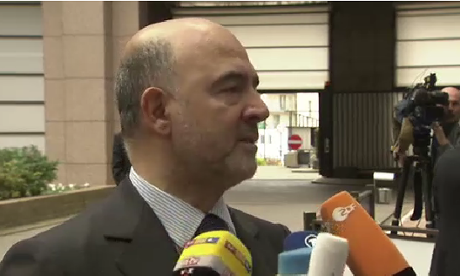 Moscovici says he had “very positive, very fruitful meetings” in Athens last week with prime minister Alexis Tsipras and finance minister Euclid Tsakalotos. The moves are positive. Most of the milestones are already adopted or decided. There is still a way to go. We are not yet completely there, but I am hopeful and confident that with the spirit of compromise, with good co-operation with the authorities we can make it… if not today then in the days to come. We are not far from that, but obviously there is a little way to go. Shares are falling sharply on the Lisbon stock market, as investors react to the latest political upheaval in Portugal. The main stock index, the PSI 20, has shed more than 2%, as the country’s socialist parties prepare to oust the centre-right administration sworn in two weeks ago. Portuguese sovereign bonds are also continuing to fall, showing greater anxiety over the prospect of an anti-austerity government taking over. 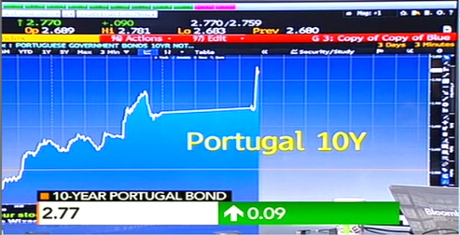 The 10-year Portuguese bond is now yielding nearly 2.9%, a jump of 23 basis points. That’s a four-month high. Over the weekend, four left-wing parties put aside their differences to support a legislative programme. They collectively hold a majority of seats in the parliament, following October’s election. Analysts at the Royal Bank of Scotland Group have already warned that the Socialist-led program “is clearly less market-friendly than the one of the incumbent government,” Bloomberg flags up. Now here’s a thing. Greece is apparently hoping to return to the financial markets next year. Government insiders have told the Financial Times that plans are afoot to sell debt in the capital markets in 2016. Despite the wild drama this year (capital controls, failing to repay the IMF, nearly leaving the eurozone), Athens hopes that investors will put their faith in them. It won’t be in the first quarter but summer has been talked about,” said a person familiar with the situation. Experienced City investors may raise their eyebrows…. European Commissioner president Jean-Claude Juncker has just welcomed eurogroup president Jeroen Dijsselbloem to his office, for talks ahead of this afternoon’s meeting of finance chiefs. Rosenstreich is worried that Athens and its eurozone neighbours couldn’t reach agreement on how to handle the repossession of houses from people who are in default on their mortgages. It suggests the whole third bailout deal, agreed after so much angst in July, may be in early trouble. Left-wing Syriza is concerned that the high threshold will expose too many Greece citizens to the loss of their primary properties. In addition, Athens is balking at a 23% take rate on private schools. This feels like a repeat of 8-months ago. The whole world understood that the third bailout agreement made was unsustainable. It was only a matter of time before it unraveled. AFP’s man in Brussels, Danny Kemp, has heard that the outstanding issues between Greece ands its creditors *might* be resolved in a few days. The OECD has also cut its forecast for global growth this year to 2.9%, down from 3%, due to the sharp slide in trade. It also predicts growth of 3.3% in 2016, down from 3.6% previously. Exclusive Interview with the students who interrupted Cameron coming soon on Sky. They got CBI accreditation by setting up a fake company. The OECD’s latest economic outlook is online here. The OECD has just released its latest economic projections. And the Paris-based thinktank has warned that global growth is threatened by the impact of China’s slowdown on world trade, but raised its forecast for US growth. It also urged richer countries to step up investment while keeping monetary policy loose, as my colleague Katie Allen explains. The thinktank’s twice-yearly outlook highlights risks from emerging markets and weak trade. The thinktank edged up its forecast for economic growth in the group of 34 OECD countries this year to 2.0% from 1.9% in June’s outlook, when it had noted a sharp dip in US growth at the opening of 2015. For 2016, it has cut the forecast for OECD countries’ growth to 2.2% from 2.5%. The OECD left its forecasts for the UK little changed with growth of 2.4% this year and next, compared with a forecast for 2016 growth of 2.3% made in June. The US economy, the world’s biggest, is now seen growing 2.4% this year and 2.5% in 2016, compared with June’s forecasts of 2.0% and 2.8%. Greece’s economy minister, George Stathakis, has suggested that eurozone governments might have to take a ‘political decision’ on whether Greece should get its €2bn aid tranche. The thorny issue is the distance that separates us on the issue of protecting primary residences. “I think the negotiations we conducted with the institutions has closed its cycle .. so it’s a political decision which must be taken. Two eurozone officials have told the Wall Street Journal that there’s no chance that Greece will get its €2bn bailout loan at today’s eurogroup meeting. That won’t please Michel Sapin, given his optimistic comments earlier. But it appears that Greece simply hasn’t done enough to satisfy lenders…. …in particular, over how to treat householders who can’t repay their mortgages. Athens and its creditors are still divided over which householders should be protected from foreclosure. Senior officials from the currency union’s finance ministries were updated on Greece’s implementation of around 50 promised overhauls, known as milestones, during a conference call Sunday afternoon. While progress has been made on some issues—including measures to substitute a tax on private education, the governance of the country’s bailed-out banks and the treatment of overdue loans—Athens and its creditors will need more time to sign off on all overhauls, the officials said. Greece needs the fresh loans to pay salaries and bills and settle domestic arrears. However, the government faces no immediate major payments to its international creditors, reducing the sense of urgency. There will be “no agreement on [the] €2 billion,” one official said. Drama at the CBI conference! David Cameron’s speech has been briefly disrupted by protesters, chanting that the CBI is the “voice of Brussels”. Cameron handles it pretty well – suggesting they ask him a question rather than looking foolish. Another important meeting is taking place in Brussels today. UK business secretary Sajid Javid will discuss the crisis in Britain’s steel works with EU economy and industry ministers this afternoon. David Cameron is telling the CBI that he’s met business concerns, by cutting red tape and corporate taxes. On infrastructure, he says the government has made progress – citing the planned HS2 railway – but admits there’s more to do. We want to the most business friendly, enterprise friendly, government in the world, he adds. But the PM also acknowledges that Britain must do better on exports. And he’s now outlining a new plan to give everyone guaranteed access to broadband, by 2020. 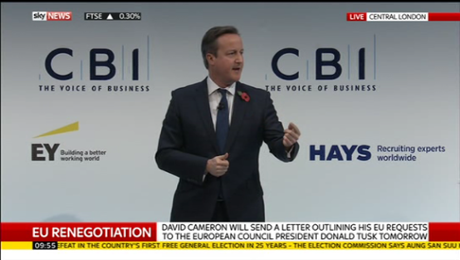 Heads-up: prime minister David Cameron is addressing the CBI’s annual conference in London. There’s a live feed here. He’s expected to warn that he could consider campaigning to leave the EU, if his attempts to reform Britain’s relationship with Brussels is met with a ‘deaf ear’. The prospect of yet another tussle over Greece’s bailout programme is casting a pall over Europe’s stock markets this morning. The main indices are mainly in the red, as investors prepare to hear the dreaded phrase ‘eurogroup deadlock’ again. Conner Campbell of SpreadEx says that Greece’s “sluggish progress” over implementing foreclosure rules is an unwelcome reminder of the eurozone’s lingering issues. The country’s next €2 billion tranche, which should be signed off at today’s Eurogroup meeting, is currently being withheld by Greece’s creditors, who are dissatisfied with the way the region’s hot potato has (or hasn’t) implemented the required reforms. It’ Déjà vu all over again, as China’s stock market is pushed up by stimulus hopes, and Greece’s bailout hits a snag. Open Europe analyst Raoul Ruparel points out that today’s dispute is small potatoes, compared to the big challenge of cutting Greece’s debt pile. That’s a slightly unusual issue for a hard-left party to go to the barricades over, when it needs agreement with its lenders to unlock the big prize of debt relief. France is playing its traditional role as Greece’s ally, ahead of today’s meeting of eurozone finance chiefs. 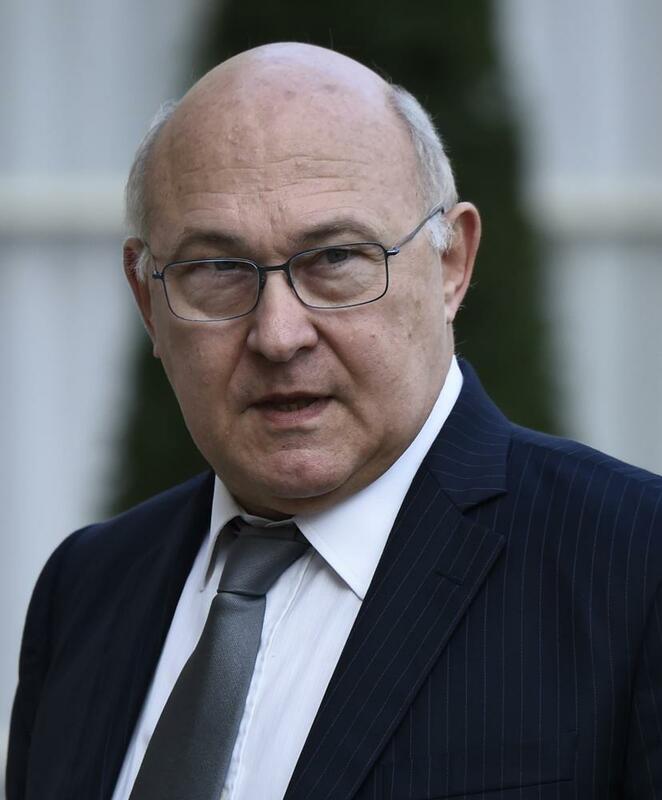 French finance minister Michel Sapin has told reporters in Paris that he hopes an agreement can be reached today over the main outstanding hurdle — how to handle bad loans at Greek banks (as explained earlier). Greece is making considerable efforts. They are scrupulously respecting the July agreement. One thorny issue remains: the seizure of homes for households who can’t pay their debts. I want an agreement to be reached today. France wants an agreement today. France Finmin Sapin: Greece has made “considerable efforts.” Wants deal at Eurogroup meeting today. The prospect of a new anti-austerity government taking power in Portugal is hitting its government debt this morning. The yield (or interest rate) on 10-year Portuguese bonds has risen from 2.67% to 2.77%, a ten-week high. That’s not a major move, but a sign that investors are anxious about events in Lisbon. This new dispute over Greece’s bailout comes three days before unions hold a general strike that could bring Athens to a standstill. The main public and private sector unions have both called 24-hour walkouts for Thursday, to protest against the pension cuts and tax rises contained in its third bailout deal. ADEDY, the civil servants union, accused the government of taking over “the role of redistributing poverty”. Just six week after winning re-election, Alexis Tsipras is facing quite a wave of discontent…. Greek officials have already warned that the argument over legislation covering bad loans won’t be resolved easily. There is a distance with lenders on that [foreclosure] issue, and I don’t think that we will have an agreement soon. Prime minister Alexis Tsipras discussed the issue with Commission chief Jean-Claude Juncker yesterday. The official added that those talks were a step towards resolving the issue at “a political level”; Greek-speak for a compromise hammered out between leaders, rather than lowly negotiators. After a couple of quiet months, Greece’s debt crisis has loomed back into the spotlight today. A new dispute between Athens and her creditors is holding up the disbursement of Greece’s next aid tranche, worth €2bn. Athens spent last weekend in a fevered attempt to persuade its creditors that it has met the terms agreed last summer, to qualify for the much-needed cash. But it appears that lenders aren’t convinced, meaning that the payment won’t be signed off when eurogroup ministers meet in Brussels at 2pm today for a Eurogroup meeting. The two sides are still arguing over new laws to repossess houses from people who are deep in arrears on their mortgage payments. Athens is trying to dilute the terms agreed in July’s bailout deal, but eurozone creditors are sticking to their guns. They insist that Greek residences valued above €120,000 should be covered by the foreclosure laws, down from the current level of €200,000. The key stumbling block is primary residence foreclosures. Greece has put forward stricter criteria that protects 60 percent of homeowners, while suggesting that this is then gradually reduced over the next years. And Greece certainly needs the money, to settle overdue payments owed to hundreds of government suppliers who have been squeezed badly this year. Across the globe, investors are finally facing the prospect that the long run of record low interest rates is ending, at least in America. There’s now a 70% chance that the US Federal Reserve hikes borrowing costs in next month’s meeting, according to this morning’s data. This follows Friday’s strong US jobs report, which show 271,000 new positions created last month. With earnings rising too, Fed doves will probably be tempted to finally press the rate hike button at December’s meeting. That is pushing up the dollar this morning, and weakening the euro. That will please the European Central Bank, as it ponders whether to launch its own new stimulus measures. The OECD will issue new economic forecasts at 10.30am GMT. Britain’s business leaders are gathering in London for the CBI’s latest conference. The event is dominated by the UK’s “Brexit” referendum, and claims that the CBI is too pro-EU. Eurozone finance ministers are holding a eurogroup meeting in Brussels this afternoon. And there is fresh drama in the eurozone. In Portugal, three left-wing parties have agreed to work together in a new “anti-austerity government”. That will bring down minority administration created by Pedro Passos Coelho two weeks ago, after October’s inconclusive election. 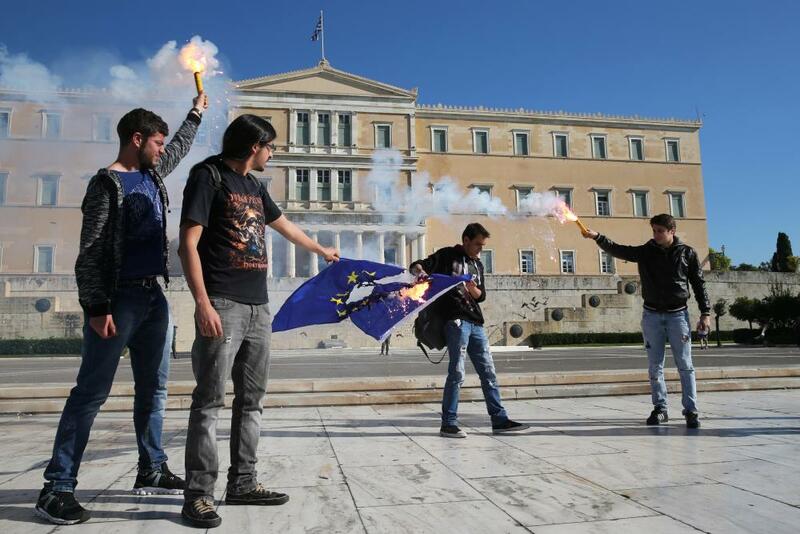 And with Greece struggling to implement its own austerity measures, Europe’s problems are pushing up the agenda again. We’ll be covering all the main events through the day….